In 3-quart serving bowl, layer all salad ingredients in order listed. In small bowl, combine all dressing ingredients; blend well. Spread dressing evenly over salad. Cover; refrigerate at least 2 hours or overnight. Just before serving, toss gently to mix. One 10-ounce bag of prepared salad greens yields about 6 cups. Substitute 8 ounces of fresh, cut-up cooked crabmeat for the imitation crabmeat. 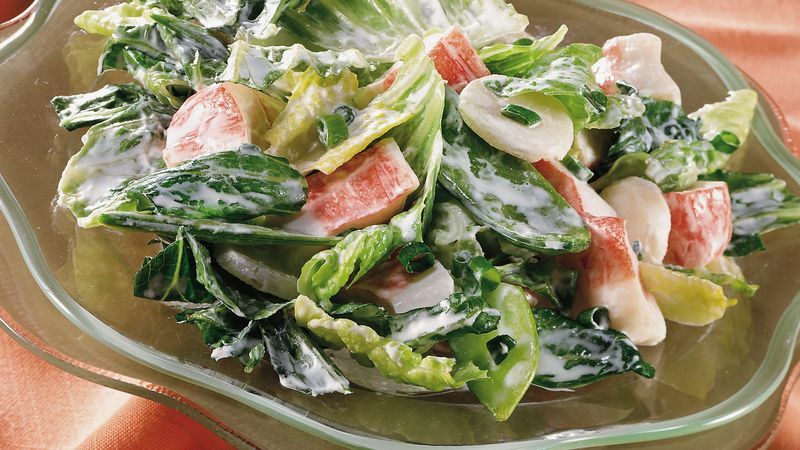 To reduce the fat in each serving of this salad by about 11 grams, use light mayonnaise and light sour cream in place of the regular ingredients. This salad can be tossed and eaten immediately. For best results, chill all the ingredients well.